Turns out PR wasn't as "lit" as Horgan thought. Buckeye19 wrote: Turns out PR wasn't as "lit" as Horgan thought. Plus he forgot to set his alarm so that he'd be "woke". Urban Cowboy wrote: Plus he forgot to set his alarm so that he'd be "woke". And conveniently made himself unavailable on "vacation" for the media horde he had to know would be dogging him into 2019 for an explanation of the failure he knew was coming. Last edited by twobits on Dec 23rd, 2018, 4:00 pm, edited 1 time in total. How convenient someone may be on vacation at this time of the year. That’s so bizarre and unnatural. Obviously a conspiracy. ^^^Out of approximately 1600 posts on the topic? Quit trying to make a mountain out of a molehill, RW. Sounds to me like you are saying this referendum was a stupid from the get go. I would agree with you on that one. It was a typical NDP/GREEN idea that should never have been started. A total waste of time and OUR money like most other things they purpose. Omnitheo wrote: How convenient someone may be on vacation at this time of the year. That’s so bizarre and unnatural. Obviously a conspiracy. Perhaps not normally, but this was a monumental change in our electoral system that his gov't put forth. Given that the anticipated date of return results was fairly narrowly defined and expected, ya, you bet it is a bit bizarre and unnatural for the Premier to be on "vacation" for the result lol. He has another moniker to add to Smiling John. That would be Hiding Horgan. Weaver has said more post referendum than Horgan. Horgan is behind closed doors right now with trusted advisers trying to figger out how to maximize his MLA pension. Horgan's lights aren't lit, and no one's answering the door. He's hiding until Cronk and Sinclair tell him what to do next. Gone_Fishin wrote: Horgan's lights aren't lit, and no one's answering the door. He's hiding until Cronk and Sinclair tell him what to do next. Well just to be fair let's not forget that his lights have never been on. It's more of a groping around in the dark looking to find whatever he can to pillage, as long as opportunity presents. A total waste of time and OUR money like most other things they purpose. TOIFA Vancouver cost BC taxpayers $11 MILLION! 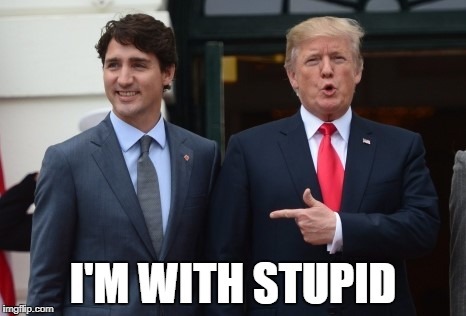 No, no, that's Trudeau doing the groping. Horgan's bulb has been burnt out for a long time. Wilkinson mopped the floor with him the first time the two appeared together on a stage for the public to see. Horgan's not looking forward to dealing with Wilkinson's far superior intelligence. Proportional Representation is an NDP/Green thing cause they know this will be the last time in a long time they'll be at the wheel, PR ensures they can throw a wrench in just about anything in the future. "Indian travellers visited Canada in record numbers in 2017 with 254,000 arrivals. With an increase of 18% over 2016 arrivals, India saw the strongest growth recorded from our Asia-Pacific markets. Indian tourists spend on average close to $1,500 per trip to Canada." You really are getting desperate trying to defend the indefensible - "sticky fingers" Horgan and his thieving ways - stealing taxpayer $$$ to pay for the incompetently run and bankrupt BC NDP. Good ole BC NDP - "tax and waste"! flamingfingers wrote: ^^^Out of approximately 1600 posts on the topic? Quit trying to make a mountain out of a molehill, RW. "Give a voice to more people - vote Pro rep"
Go ahead, pretend away that you don't care that "sticky fingers" Horgan and egregious Eby fluffed this up. An honest ballot would have given voters a menu of options, including the current first-past-the-post system, and asked them to pick. It could have asked them to rank their choices; it could even have presented them with just two, namely first-past-the-post versus a fully fleshed-out alternative, explained via deep public consultation. Instead, the 2018 ballot asked voters whether they wanted the status quo or some other, unspecified alternative. It was silent on the details. It was like asking kids whether they wanted spinach, or something – anything – else. The first question having been designed to assure the status quo would lose, the ballot then asked voters a second question, which seemed to have been designed to guarantee that the government’s preferred option would win. Voters were presented with three forms of proportional representation: two theoretical schemes used nowhere else, and a system known as mixed-member proportional. But even the details of the proposed mixed-member proportional system, the system that was supposed to win the referendum, were to be left to the discretion of the government. It was like asking someone if they wanted the usual for lunch, or a sandwich. What kind of sandwich? Can’t say. Vote “sandwich” and leave it to the politicians to figure what goes between the bread. What the does TOIFA have to do with the referendum. Are you saying because someone shoots a Bacon brother it is okay for me to shoot someone or is wrong, wrong no matter who does it.